You are currently browsing the tag archive for the ‘drury lane’ tag. Apocryphal or no, I have little doubt the story’s origins go much further back. It would not surprise me if it was first told in Ancient Greece about an actor performing in one of Aristophanes’ comedies. It is a tale that has been attached to several comedians since, not least Dan Leno, whose depression was also legendary. Joseph Grimaldi came from a line of Italian dancers and performers but was born and brought up in London. It is he we have to thank for the prominence of clowns in entertainment and for British pantomime existing in the form it does. A master craftsman when it came to performing in Commedia dell’Arte, an Italian style that became popular in the 16th century, Grimaldi’s antics in 19th-century Harlequinades transformed the clowning to such an extent that the clown ended up replacing the character of Harlequin. Next time you go to a Christmas pantomime and sing along, think back to The Great Grimaldi for it was he whose comic songs were so popular that they became a permanent fixture in pantomime. And if you’ve ever wondered why clowns are so often called Joey, think again of Grimaldi. Having retired in 1823 from ill-health and exhaustion — ‘I have overleaped myself’ — Grimaldi ran out of money in 1828, though he was then helped by a yearly pension of £100 from the Drury Lane Theatrical Fund, and various benefit performances were staged to help him. He spent his remaining years in great pain from a body that he had pushed to the limit. Grimaldi is dead and hath left no peer… We fear with him the spirit of pantomime has disappeared. Joseph Grimaldi is buried in the courtyard of St James’s Chapel in Pentonville and is commemorated every year on the first Sunday in February at the Holy Trinity Church in Dalston, The Clowns’ Church, with the Joseph Grimaldi Memorial Service. Since 1967, clowns have been able to attend the service wearing their costumes. ‘By the time this post appears I’ll be in Italy preparing to direct Jack & the Beanstalk for the biennial Venice pantomime, so it seems an appropriate time to write about the man who shaped the pantomime dame as we know her today: the great Dan Leno. Dan started life as George Galvin, the child of two struggling music hall performers and if he wasn’t quite born in a trunk in the Princess Theatre, he was certainly soon a part of his parents’ endlessly travelling, bread-line existence. At the age of three he made his stage début as Little George, the Infant Wonder Contortionist and Posturer. via The History Girls: There is Nothing Like a Dame, says Laurie Graham. For fans of vintage theatre, visit my First Night Vintage store for Dan Leno and many more performers. 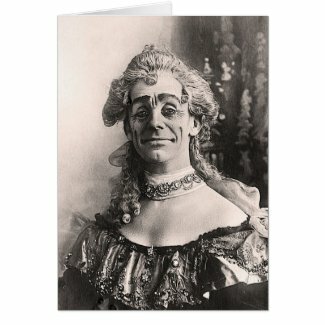 See also Dan Leno in Mother Goose at Drury Lane in 1902. Dan Leno was one of the most famous music hall comedians of his time (1860–1904) and was the forerunner of them all, the inspiration for many comedians and actors since. This image comes from an original theatrical postcard in my collection which shows him playing pantomime dame in a 1902 production of Mother Goose at Drury Lane under the management of Augustus Harris. Leno’s contemporary, the actor-manager Herbert Beerbohm-Tree, once said to one of his leading ladies, Constance Collier, that if Dan Leno had played Richard III, he would have been the greatest Richard ever.